More than 70,000 different chemicals are in production today in the USA. Thousands of chemicals are in our food in the form of emulsifiers and preservatives and are used in food processing. The air we breathe is permeated with automobile exhaust and factory residues. Public water sanitation uses more than 500 chemicals to treat our tap water. Regular use of a Far Infrared Sauna is the most effective and efficient therapy to clean your body from the inside out and restore the body’s ability to heal itself from the inside out. 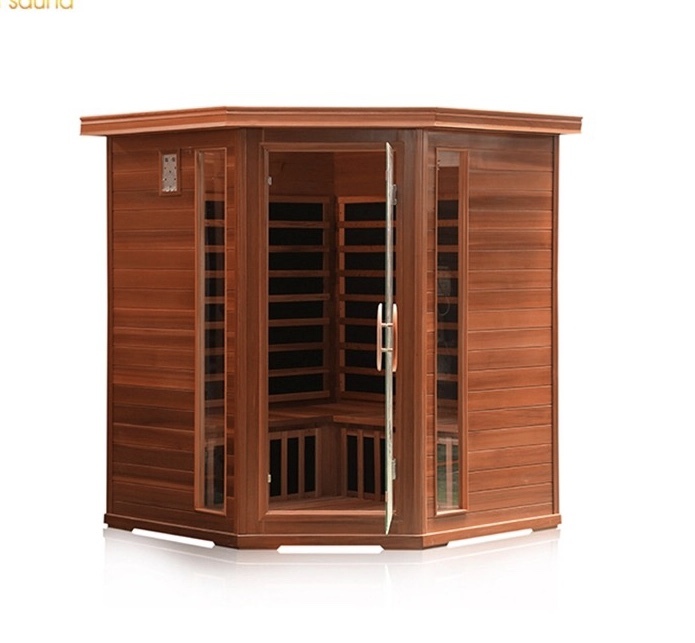 In addition, many studies have shown many other amazing benefits of regular red light sauna usage. People who use a sauna for light therapy three times per week were shown to lose 4% body fat in 30 days on average without changing anything else. Those who did four or five times per week lost 5% of their body fat. That’s 5lbs for every 100lbs of body weight. In the infrared sauna at our wellness lounge, you can disrobe to your level of comfort. The light therapy is best done witthe h least amount of clothing, either a bikini or briefs. Infrared sauna therapy at our light therapy lounge in the Financial District is about how a sauna can be used as a tool to treat illness and injury. It’s also about how an infrared sauna can be used to keep you healthy and help you keep up with the wear and tear of daily living. At first, I found it hard to understand how simply sitting and sweating in a sauna could possibly provide such a wide range of health benefits. You may have thought the same thing. As I kept studying the topic, though, I finally came to understand why red light sauna therapy is so powerful. By the end of this page, you’ll understand it too. This speeds up healing. In the case of some resistant, slow-healing injuries, infrared light therapy can make healing possible. Increased blood circulation is responsible for this healing effect. The blood, after all, is responsible for carrying oxygen and countless other healing factors (depending on what’s needed — i.e., white blood cells, vitamins, minerals, prostaglandins, etc.) to every cell in the body. If you have a slow-healing injury, consider using infrared light therapy at our Financial District wellness spa. In other words, infrared sauna therapy can take the body out of the grip of stress chemistry. Stress has an acidifying effect on the body and during times of stress, the body focuses on mobilizing the system for survival over healing, making red light therapy a good option for helping this phenomenon. A mildly heightened body temperature carries certain benefits (see more below). For those with a sub-normal body temperature, this allows many functions to normalize simply be using the infrared sauna. This happens because sweat provides an alternative channel to the body to eliminate toxins, creating a pathway for toxins that would have ultimately been dealt with by another organ. More on that blow. You can be sure that if you have a condition that can be helped by infrared sauna therapy, the reason for this lies in one or more of these six effects. As your body temperature rises in the red light sauna, your body attempts to cool itself by sending your warm blood to the surface of the skin where it can cool. At the skin’s surface sweat is produced — the sweat’s evaporation on your skin also provides a cooling effect for the body. In order to deliver blood to the surface of the body, the heart increases both the amount of blood it pumps with each contraction (stroke volume) and the speed of the heart rate (measured as your pulse). Now here’s the bonus from the increased circulation produced by infrared sauna therapy: where your blood goes, all the good things it carries are brought along with it. From this, you can understand why injuries and certain illness heal more quickly with sauna light therapy at our Financial District wellness spa. The Tendons And Ligaments: this enhances their flexibility. So here you see an example of how increased circulation helps even in places where an injury isn’t present. To understand this effect isn’t complicated, especially if you just remember that the body is always looking for opportunities to get rid of wastes and toxins that don’t belong inside us. Sweating is part of the body’s design to rid itself of wastes. When we sweat, the body uses this as a bonus opportunity to throw unwanted wastes in the stream of sweat and thereby discarding them. It’s automatic for the body to use sweat in this way. In other words, when you sweat the body eliminates whatever toxins it is able to at that moment along with the sweat. This can include: body wastes, chemical toxins, heavy metals, and even ionizing radiation which has been stored in the body (visit back for more information on how ionizing radiation can be eliminating through a sauna detox program on our upcoming sauna studies page). Note that sweat can also carry minerals out of your body that are useful — this is why minerals need to be replaced in heavy sauna detox programs (programs which use sweating to detoxify the body). Read more here. Any one of the dangerous chemicals we are exposed to daily in the environment or our diets can cause health problems. And any one of the heavy metals — lead, nickel, or mercury. for example — that we are all exposed regularly can also cause a variety of health problems. Since this is true, then you can understand that getting rid of any of these substances can help you rid yourself of the health problems they cause. This is why sweating in general can have so many potential health benefits and why red light saunas, in particular, are so beneficial. Further, when you sweat in the sauna, you aren’t ridding yourself of only one of these damaging substances; you are ridding yourself of a multitude of these. Since stress seems constant these days, it is easy for your body to get trapped in a continual stress reaction. Scientists believe that the body’s stress response system was developed to handle acute (episodic) stress, and wasn’t designed to be in high gear throughout the day, day in day out. For this reason, it is vital to engage in the services of a wellness spa such as Lemon Light Lounge. It’s a tremendous relief for the body to undergo the calming effect that infrared sauna therapy offers. Think of it as a rest from the terrible grip that stress has on so many of us throughout the day. This grip — the result of the activation of the sympathetic nervous system — does certain things which may be good for surviving a stressful event, but are not so good for your health if they go on and on without relief. The body reacts to stress in automatic ways. In fact, there is a whole automatic (called “autonomic”) nervous system present in our bodies that gears up the body to handle stressful challenges — this is called the sympathetic nervous system. There’s another part of this same autonomic nervous system that calms the body systems called the parasympathetic nervous system. What many people don’t know, however, is that when the sympathetic (exciting) nervous system is activated, one of the messages it sends is to the adrenal glands, which sit on top of the kidneys, to release various stress hormones. Together, the sympathetic nervous system and the adrenal hormones help mobilize the muscles and organs for action, confronting a threat. Blood flow is shifted away from the periphery (limbs and skin, for example) and toward the major muscle groups involved in running and the organs. These stress hormones, such as cortisol, send messages of their own through the body. Some of the effects adrenal hormone release are for the body to make more blood sugar and free fatty acids available in the bloodstream, and to make platelets “stickier”. The effect is acidifying for the body, requiring the body to use precious minerals to neutralize these effects. Countering this stress reaction with Far infrared sauna therapy is vital. Raising your body temperature more than a few degrees is dangerous, but thankfully you have nothing to worry about when under the care of our wellness spa team. Danger is rare and totally avoidable with careful use of the sauna for far infrared sauna therapy. So, how can raising the body temperature a degree or two can benefit you? Keep reading to find out. One thing researchers have noted (see our upcoming sauna studies page) is that skin wounds heal more quickly in warmth. It is possible that this occurs because more of the oxygen and healing factors that your blood carries are being delivered to the damaged or diseased tissues during sauna use. But the positive effects of heat are nonetheless clear – infrared sauna therapy helps heal wounds. For some disease-causing organisms and microorganisms, heat is directly disabling. In other words, certain organisms can’t survive well in higher tissue temperatures. Weakened cells – cells that are on the way out due to age or damage – don’t withstand heat as well. So, in a heated tissue environment, weakened cells will be the first to go. In fact, scientists on other continents and in other countries (Japan and Europe, for example—see our upcoming sauna studies page) are using this aspect of infrared sauna therapy to attack cancer. Cancer cells, in some cases, appear to be more sensitive to heat than the surrounding healthy tissue. When your body is heated, your metabolic rate (the speed at which biochemical reactions take place in your body) increases. If you are someone with a low metabolism, returning your body temperature to normal will allow important body functions to be normalized. Our infrared sauna is similar to a traditional sauna, but it uses infrared light to heat you directly instead of heating the air. The result is a much more comfortable experience. Saunas help rid the body of toxins while cleansing the skin with the excess sweating, they increase circulation to facilitate better recovery, heat stress causes your body to release heat shock proteins to promote muscle growth, and using a sauna can increase your body’s time to fatigue, meaning you’ll develop more endurance. Plus the heat stress causes your bodies to release the same chemical that causes ‘the runner’s high’. Red light saunas are an easy way to boost performance while relaxing. Our Sauna also comes equipped with a chromotherapy light. Chromotherapy is used in hospitals to help manage depression that comes from seasonal affective disorder, but our light also cycles through different colors to produce different effects. We can increase circulation and sweating, or set it to more calming colors. Our infrared sauna sessions only take 30 minutes to feel completely rejuvenated.